Muggle-born Hermione quickly became top of her class. Most would call her a know-it-all, but many would refer to her as, “The Brightest Witch of her Age.” Due to her brilliant academic mind, the sorting hat considered placing her into Ravenclaw but ultimately chose Griffindor where she met her best friends, Harry and Ron. While she often helped them in their studies, the boys helped her to embrace her rebellious side. Allowing her to venture outside the Library and put her studies to good use. When I was reading Harry Potter, Hermione was my favorite character. She still is my favorite character but back then I remember talking with my friends about the books and feeling weird about my choice. My friends would declare, Ginny, Luna or Harry to be their favorites. Some had crushes on Snape. I always felt funny and thought, does loving Hermione make me simple? But Hermione is anything but simple. Like many of the women this month, she is a strong independent woman, consumed with books and focused on learning as much as she could. For the most part Hermione was too busy to care about her looks, though being a teenage girl she wasn’t entirely self-effacing. When Draco hit her with a Densaugeo spell which rapidly grew her already above averagely large teeth. Later when Madam Pomfrey had to minimize them, Hermione had her shrink her teeth to a much more normal size than prior to the hex. 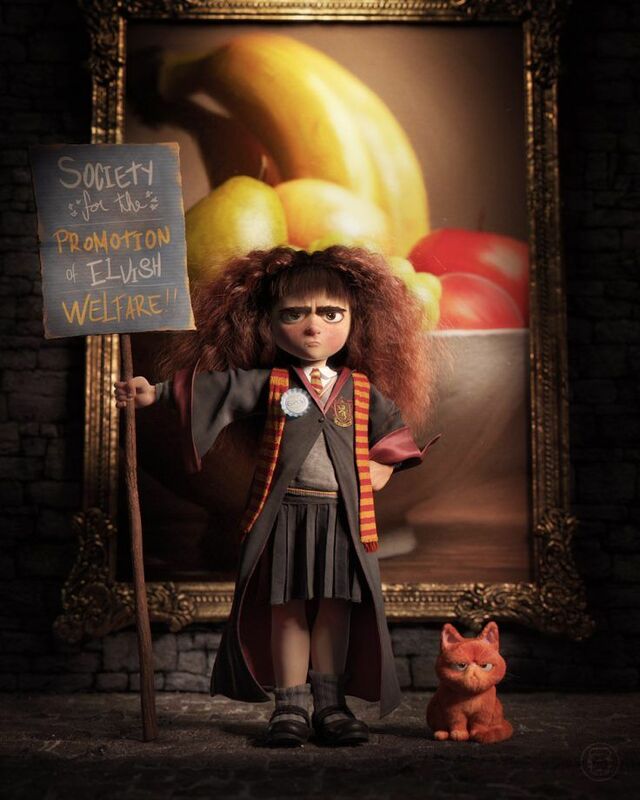 Aside from learning, Hermione devoted her time to S.P.E.W., the Society for the Promotion of Elfish Welfare. She created S.P.E.W. after realizing how badly Elves were treated. Although she was passionate about liberating Elves from their lives of servitude, she had little support including Hagrid and the Elves themselves. There is some controversy surrounding Hermione ending up with Ron, even author J.K. Rowling has voiced regret in the pairing. I really wish she didn’t do this. When I was reading the first book, I hoped that Hermione and Harry would get together and was disappointed when it was obvious she was going to end up with Ron. Then I warmed to the idea, because perhaps he was the yin to her yang. Because although she was serious and studious, Ron’s playful nature helped her to relax and not take herself so seriously. Overall, Hermione proved her importance time and again. Harry Potter might have been the chosen one but he would have died in year one without Hermione. One of my favorite Hermione moments did not make it to the films. I loved the part where Hermione must use her logic to solve a challenging riddle Professor Snape left in order to protect the sorcerer’s stone. The thing I love most about Hermione is her parents. Muggles they are and so unprepared for an extraordinary child, yet they rise splendidly to the challenge. That’s a good point. I always wanted more backstory for Hermione. I’m pretty sure her parents don’t even have proper names!